The Bob Boyce Battery Smacker Kit (U solder, U wind, U assemble) Comes with all parts to put together the Bob Boyce longitudinal and electromagnetic battery de-sulfator. You solder and you wind the two 1.5" toroids, takes time. Takes about 4 hours to complete. Also comes completely assembled and tested. A 6V, 12V OR 24 volt battery de-sulfator. Restore those expensive batteries. Will NOT rebuild a damaged battery, but will take of the lead sulfate webbing and turn the lead sulfate back to acid. Rejuvenating your battery to extend battery life by double to even triple the life! Comes fully assembled and tested or a U-solder/U-wind the toroid kit. Listen to Bob Boyce® the inventor talk about it at the Tesla Tech Conference. De sulfate your dead batteries, don't buy a new one. Try smacking it first! Hook up this simple device for 2 to 4 hours and you will be surprised how a battery will come back to life. Great for maintaining a rack of expensive solar batteries. Works on 6 volt, 12 volt and 24 volt batteries. Stubborn, older batteries may need 3 days or a week of hook up and pulsing. The only battery de-sulfater that uses the pulsing of the electro magnetic field plus the addition of non-hertzian energy. De sulfating potential can be up to 100 volts DC! Using but only 200ma of power! Batteries can absorb both energy sources. Does not heat up, will last for years to come. NOT like other battery de-sulfators that heat up and get damaged over time and bounces back and forth from 12v to 50volts causing heat and breakdown of the circuit. Your power source must be higher voltage than your output battery. ( subject battery that is being smacked.) 12volts to 16volts. Works with dry gel cells as well as lead acid batteries! 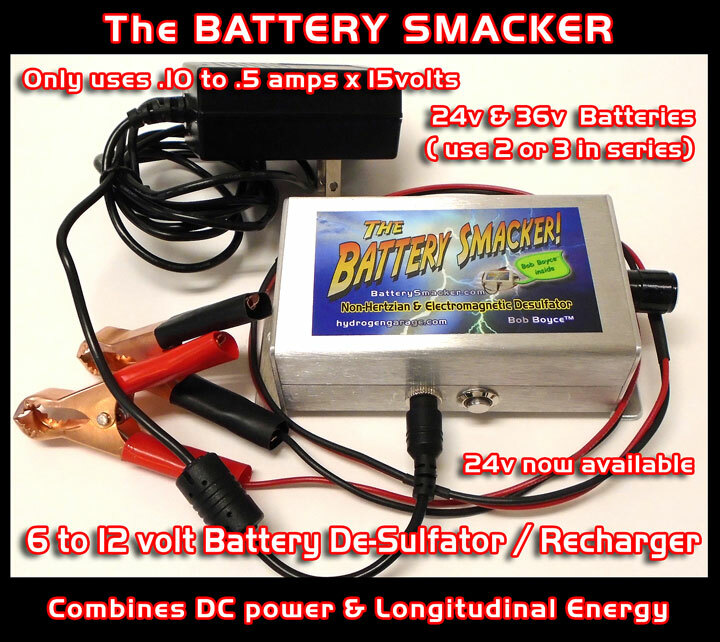 Bedini has the "Battery Spanker", so we decided to call it the "Battery Smacker." The BB Battery Smacker harbors 2 toroid coils, one positive choke and one negative inductor. A Bob Boyce® invention. The BB Battery Smacker will only work on batteries who's cells are not damaged. Burnt, bent, or eroded plates will not work. Old batteries that were sitting around for years, may be able to be rejuvented. Some work, some DO NOT, depends on the plate damage, warped or dissolved plates. Take off the caps and look down into the battery cells with a flashlight to view the crystals and hairs/webbing on the plates. If you see bent plates, you may have a damaged battery. The lead sulfate will go back to acid, it will rejuvenate your electrolyte! Batteries will absorb electromagnetic and non-hertizian energy. Batteries like both energy fields. No other de-suflator will rejuvenate your batteries electrolyte back to acid! The longetudial pulsing does this job. Un heard of. Most do not study the forbidden Tesla technology, taken out of the text books. Select 6v to 12v OR 24v (add $10) below.